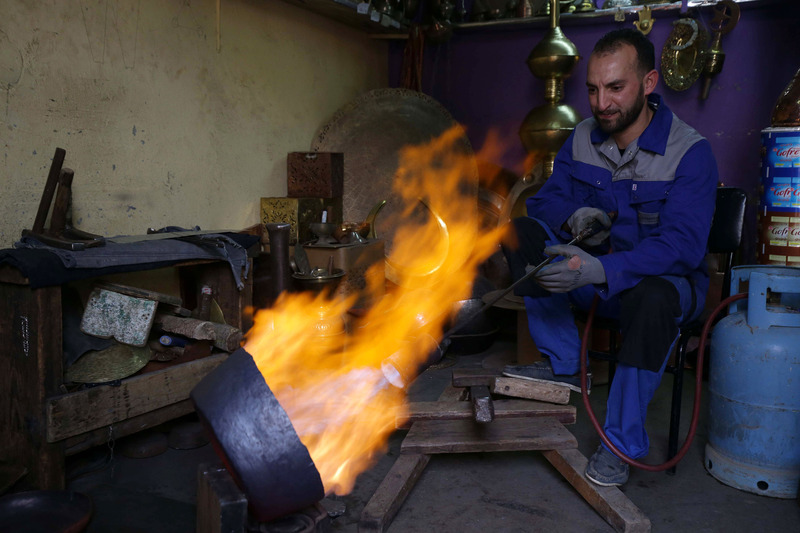 Launched in 2014, the regional project “Development of clusters in cultural and creative industries in the Southern Mediterranean”, co-financed by the European Union and the Italian Development Cooperation Agency, gives coppersmiths in Constantine a new lease of life. Implemented by the United Nations Industrial Development Organization (UNIDO), this cluster is the result of close collaboration between the Algerian government, local communities, universities and coppersmiths. 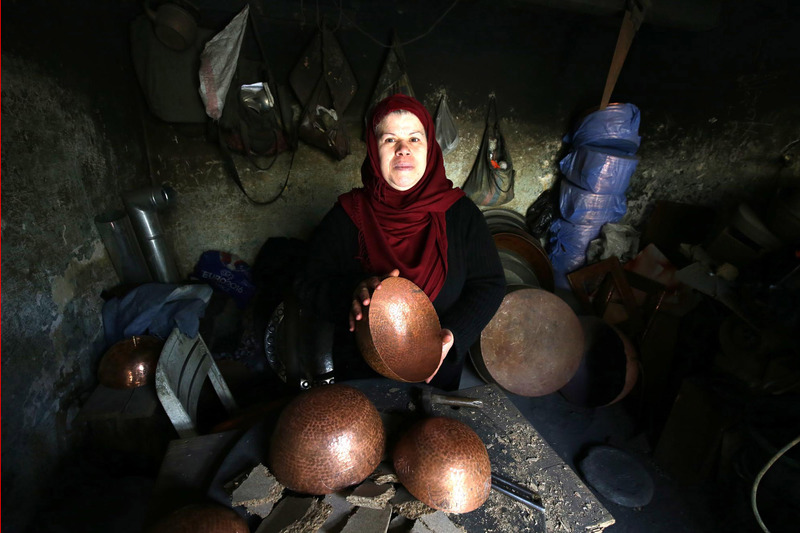 With the strength of a hammer and chisel, Chamia Makhzer, 57 years old, has carved a place in the masculine world of coppersmiths in ancient Cirta. A mother of 4 children, Chamia made small accessories for brides for a long time before she launched into copper work. “In 2013, I signed up to a coppersmith training course organised by the Chamber of Crafts and Trades in Constantine. I was the only woman involved in the promotion. At first, the men were rather surprised to see me participating in courses and advanced training. For me, it was a real challenge. And I feel like a winner,” she says, while hammering the scales of a trout, one of the symbols of the city of Constantine, on a piece of red copper. Chamia does not have a workshop. When she receives orders, she goes to the coppersmith district Bardo to complete them at one of the coppersmith’s workshops. “The coppersmiths have become my second family, some give me the opportunity to work with their tools. My dream would be to have my own workshop, be totally independent and be able to share my knowledge with other women,” she says with a smile. 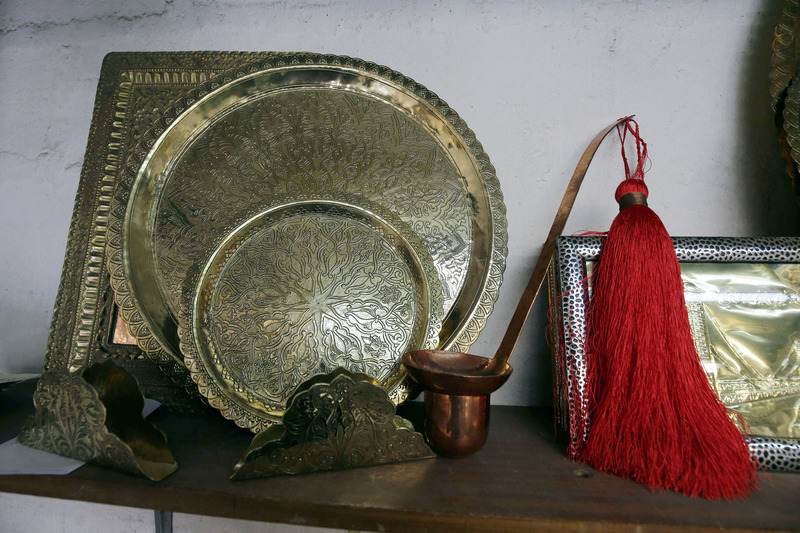 Since 2014, the traditional art of copperware has undergone a real revolution thanks to the “Development of clusters in cultural and creative industries in the Southern Mediterranean” project. Co-financed by the European Union and the Italian Development Cooperation Agency (up to five million six hundred thousand euros for all countries on the southern shore of the Mediterranean), this project has been implemented by UNIDO and the Algerian government. Many of the coppersmiths from Bardo seized this opportunity. Just like Messaoud Lecheheb who is 37 years old, known as Charif to his friends and is one of Constantine’s youngest artisans. A born artist, he quickly realised that creativity is a value that will give him access to an extensive clientele, particularly on an international level. His unique touch can be found in some of the pieces of art that have been made as part of the Merveilleuse Cirta collection, which highlights the city’s history through Berber, Roman, Arab-Islamic and Ottoman influences. “I collaborated with designers to make the pieces in this collection, which has been presented in Europe. Ever since I was very young, I have been making utensils and decorative objects for a local clientele, but this time I worked with professionals to develop products for a particularly demanding clientele,” says Charif. This working method has helped to create a partnership with both Algerian and foreign designers and strengthen the relationships between artisans. Thus, Chamia and Charif have collaborated on the Walima and Gaada pieces, composed of cups and spoons made of red copper, embellished with scarlet silk tassels. It should be noted that the Merveilleuse Cirta collection was exhibited in 2017 at the International Maisons et Objets Exhibition in Paris, the International Crafts Exhibition in Algiers and the Rasumofsky Palace in Vienna. Constantine’s cultural and creative cluster is more than just a simple support project for artisans. In addition to the aspects related to coppersmith training in several specialities, its initiators have also set out to build bridges with the scientific world. The University of Constantine 3 - Salah Boubnider has examined certain aspects related to the working conditions and environment of the coppersmiths. Furthermore, the Faculty of Medicine has carried out a study regarding the consequences of chemical products which are harmful to the health of the artisans. “The operational health laboratory has also studied the effects of noise and the risks related to the working position of the coppersmiths. 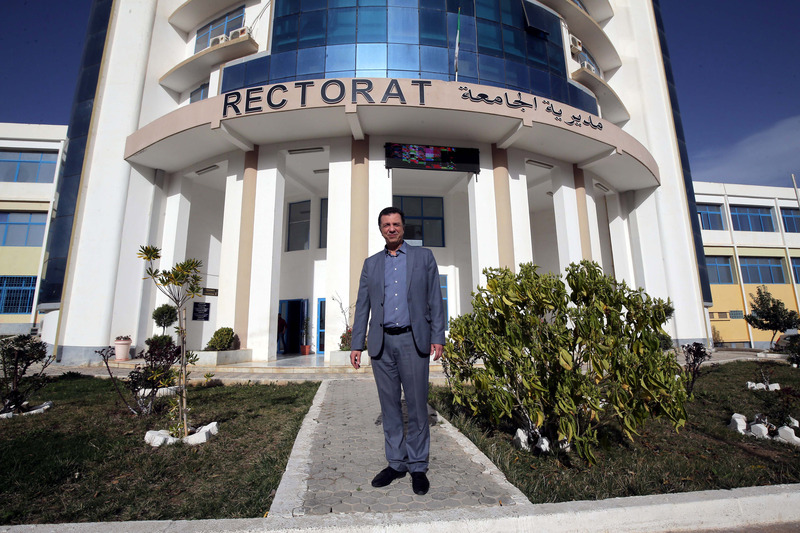 This laboratory is required to submit a series of concrete proposals in order to solve the various health problems,” indicates Professor Chawki Bennabes, Vice-Chancellor of the University of Constantine 3. The Faculty of Earth Sciences is, on the other hand, interested in the complex issue of soil pollution in Bardo and water pollution in the Wadi Rummel, which runs below the district. In addition, researchers and students from the Faculty of Art and Culture of this university centre have studied the meaning of the various symbols that appear on the pieces made by the Constantine coppersmiths and those that artisans have been reproducing for generations. “The cluster project has provided us with unsuspected fields of scientific research. Like the issues of urban planning since the results of the work carried out by our university’s faculties, which will define the future artisan district, soon to become a significant tourist attraction for the city of Constantine,” says Professor Chawki Bennabes. This issue regarding future workshops for coppersmiths is at the heart of this cluster’s development. “A workshop is a key element of success for artisans. This is all the more true in Constantine where the coppersmith district is a leading social space, it just needs a few adjustments to make it a tourist area of great value," says Choukri Benzarour, Director General of Crafts at the Ministry of Tourism and Crafts. According to him, the option that could be adopted would be to provide artisans with a three-storey building, located in the new city of Ali Mendjeli (about fifteen kilometres from Constantine), which would house temporary premises pending the renovation of Bardo. “Local authorities, particularly the wilaya (prefecture), are fully committed to finding solutions in terms of facilities for these artisans,” he says. On an institutional level, the implementation of Constantine’s cluster, as well as that of Batna for artisan jewellers, is becoming a model for the government. As part of its new economic policy, the Algerian State has decided to create business combinations for each business sector. The cluster model, as defined by this European Union project, took place just at the right time, as noted by Abdellah Telaïlia, Head of the Investment Attractiveness Division at the Ministry of Industry and Mines. “This model provides artisans with better organisation while strengthening their skills, so they can preserve their traditional trades and facilitate access to other markets for their products. This strategy has also been presented at the regional conference "Creativity, Employment and Local Economic Development in the Southern Mediterranean”, which was held in Algiers in November 2017. And what is valid for the craft sector is also valid for the more heavy duty areas of the industry. Replication is therefore possible in the automotive and textile industries by interconnecting all actors. For their part, members of the Algiers Office of the United Nations Industrial Development Organisation do not fail to express their satisfaction. Meriem Terki, Project Coordinator, notes that “the main objectives have been achieved by the two clusters developed in Algeria.” “We are all the more optimistic since the European Union decided to extend the project until 2019. This will allow us to strengthen artisan cooperatives and, above all, focus our efforts on marketing and communication aspects to export Algerian artisan products to other continents."